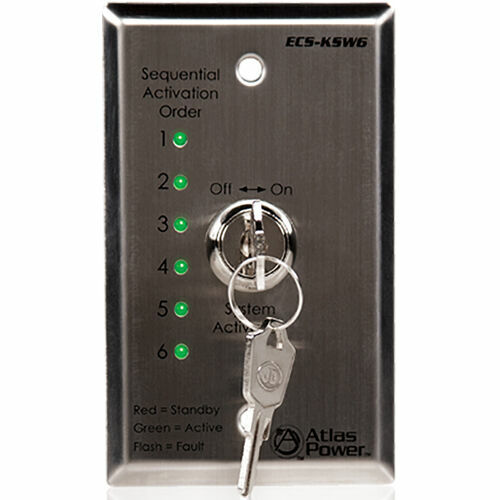 The ECS-KSW6 is a single gang electrical cover plate that works in conjunction with the ECS-6RM system controller. The ECS-6RM system controller can be remotely activated and each channel can be monitored using the ECS-KSW6 control panel. This panel can be placed several hundred feet away from the ECS-6RM controller. A Keyed On / Off switch is provided for security. There are six Bi-Color LEDs on the ECS-KSW6 panel. One LED for each of the six sequenced channels of the ECS-6RM. These LEDs mimic the Channel Activation LEDs that are on the front of the ECS-6RM panel. Wiring the ECS-KSW6 panel requires a RJ45 connector and 8 conductors. It is recommended to use CAT5 cable.